From the moment my youngest daughter could hold a pencil the world at large became a colossal sketchpad. Every surface was an invitation to illustrate and I swear she developed her own graffiti tag at 18 months. 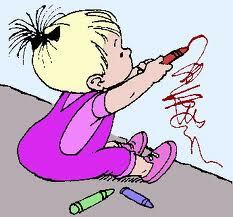 She was an infant Banksy. The week we moved into a newly renovated house she set to work boldly autographing every single one of the pristine white vinyl wrapped kitchen cupboards with a black permanent marker. We found a couple of covert works on the polished floorboards behind a TV unit and she was just starting on a door when we walked in. Nothing was sacred. Books, dolls, tables and walls – even the poor dog was routinely doodled on with felt tip markers. Relatives were similarly rewarded when she visited their homes. Her uncle and aunt could not thank her enough for adorning their new lounge suite with pink nail polish. It was difficult to maintain any kind of rage at my child’s wanton disregard for property because she was so incredibly gorgeous. A bob haired, blue-eyed blonde whose first properly articulated word was, to my eternal shame, ‘McDonalds’, it was impossible not cuddle her to death shortly after wanting to strangle her. Bored at the home of her grandparents one day she decided to draw on the bonnet of my father’s Mitsubishi Magna with a rock. The swirly design kept her amused for at least twenty minutes before someone realized it was very quiet all of a sudden. The silence did not prevail as my father blew the proverbial gasket. Some sixteen years on, he still has the car with its bespoke vehicular etching – neither of which is worth much. After some judicious aversion therapy and the threat of a foster home, she eventually moved away from decorating every available surface and concentrated on the permanent canvas of her own body. Her artwork at kindergarten was in the vein of Pro Hart’s famous carpet advertisement complete with body slide. and dressing the child in rainbow hues was the only way of camouflaging the daily self daubing of paint and paste. Of course, give her a pair of scissors and she would be practicing the ancient Chinese art of jianzhi on anything that could be cut. She re-worked the hemline of many dresses during this, her Tang dynasty creative period. I had to admire my daughter’s willingness to embrace new mediums as hanks of her own hair were lopped off and hidden amongst the cardboard rolls and pipe cleaners of a pasting or tucked away for later use in a bathroom drawer. Primary school was every bit as as chaotically and colourfully messy although by this stage it was less about art and more about being a bit of a klutz. This child of mine has never learnt in the conventionally passive manner of her older sister – the listen and learn approach. To really learn something she had to understand how and why. Much like the time she took the home telephone apart to figure out how it worked. I’m not sure it cleared very much up for her but I am quite sure I couldn’t get it back together again. By year twelve the Pi sign was an almost permanent fixture on her wrist. This was less about a particular affinity with mathematical constants and more about an odd crush on her math’s teacher – a sweaty young man with a penchant for the sweater vest. Compute to the last digit of Pi ! This little Greek letter was re-penned daily and my daughter declared that as soon as her emancipation from life as a school girl allowed, she would have the symbol professionally tattooed there. Two and half years later and 9146.5 nautical miles away from me she has finally come through on the promise of ink. 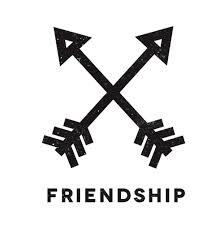 An artistically filtered Instagram photo revealed to the world a tattoo of two crossed arrows. …unless you cross me and then it’s WAR!!! Despite some vague assurances that the symbol was Native American in origin denoting happiness and a reminder not to live a boring life, some rapid fire Google research suggests it means friendship and peace…or possibly war, depending on which way the arrows point and which authentic Native American Symbology website you happen to be looking at. 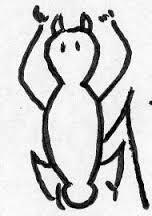 I toyed briefly with drawing a comparable Indigenous Australian Aboriginal symbol on my arm and sending her the image, but every one I found was entirely literal – an arrow is just that, an arrow and I’m not sure that the message implicit in a bush turkey or honey ant would really work. Given the indelible nature of this latest artwork, youngest offspring is understandably thrilled beyond measure with it. 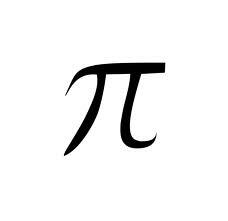 However, with no connection to an image symbolizing my daughter’s independence and no understanding of its genesis, I have found myself kind of wishing she’d gone with the Pi sign after all. This entry was posted in Family, humor and tagged children, Ethnicity, humor, instagram, Mitsubishi Magna, Pro Hart, Symbol, tattoo. Bookmark the permalink. 2 Responses to Art for art’s sake. Fantastic post, Jane – hilarious as always! Your recollections of Alex sound alarmingly similar to my current experiences with Alice. Only yesterday did Dave describe our house as “thoroughly tagged” – benchtops, upholstery, manchester, walls, doors, carpet… you name it, it’s got “Alice” scrawled over it in indelible ink. Yep, it only took 15 odd years to find the funny side. It’s a miracle she survived childhood at all given my less than tolerant parental demeanor…the distance must have mellowed me. I have always thought Alice was cut from the same cloth, the similarities don’t end with graffiti.